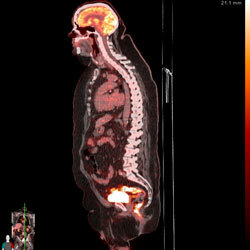 PET (Positron Emission Tomography) and CT (Computed Tomography) scans are both standard imaging exams that physicians use to pinpoint disease states in the body. A PET scan demonstrates the biological function of the body, while the CT scan provides information about the body's anatomy such as size, shape, and location. By combining the two scanning technologies, a PET/CT scan enables physicians to more accurately diagnose and identify diseases such as cancer. A PET/CT scan will require an IV injection of FDG (Fluorodeoxyglucose), which is an analog that is tagged to the radionuclide F18. This radioactive "sugar" will allow images to be taken of metabolic functions in the body. These images produce "hotspots", often indicating rapidly growing tumors. Cancerous cells generally consume more sugar/energy than other organs or tumors. A radiologist will analyze the images and create a report. A PET/CT exam not only helps your physician diagnose a problem, it also helps predict the likely outcome of various therapeutic alternatives, pinpoint the best approach for treatment, and monitor your progress.